hmmm... i can report the same as the above user, many times it wont tick and if it does the game hard locks and crashes to desktop without error. thanks to all who dedicate their free time to this! Hello, any news about how to make the table work in the new update? I do not know if it's just me but the shortcut with the -eac_launcher tag does not work anymore the game returns an error saying that it did not find easy anticheat and closes the game. Any suggestion? reinstall the modify'd .DLL Files. your game may have repaired and replaced the existing replaced ones.. it happens from time to time. That's the problem, I've done this by replacing the original DLL with the modified one and the game simply does not open, not the error just does not open. 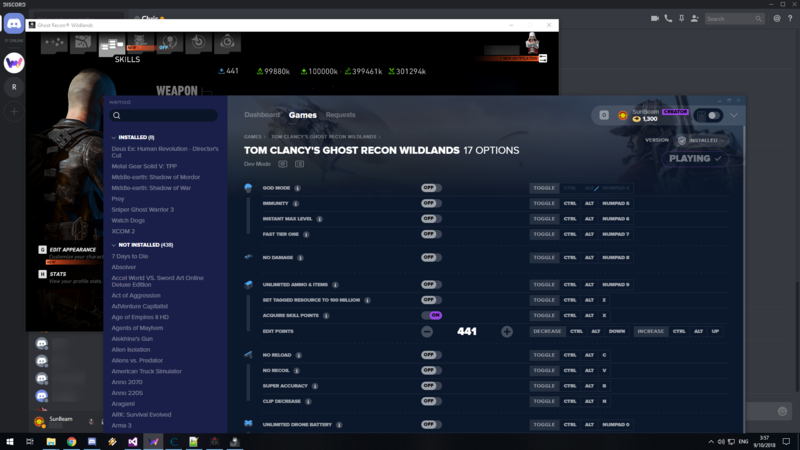 I put the tag -eac_launcher in Uplay and does the same thing the game does not open, it opens that square on the desktop as if it were loading the game, shortly it disappears and opens Uplay without any error. The method still works; it's just you don't have the updated stuff. Game crashes because the vtable in the old DLL doesn't have the offsets the new build CALLs for. Last edited by boris_the_animal on Thu Sep 20, 2018 6:51 pm, edited 1 time in total. For all of you where the dll isn't working, keep in mind that after every update of the game you have to run the game without replacing the dll first, load your saved game, move around the map a bit so it triggers the game save. One best way to trigger the game save is zooming in with your weapon and changing the fire mode once and you will see that the game save icon has been triggered. Then exit the game, replace your EasyAntiCheat_x64.dll with the moded one by SunBeam and restart the game, then it should work. This fix works for me every time after a patch of the game. I hope that helped some of you with not being able to launch the game and getting the EAC error message. It works not. I liked your method, but here it does not work I played for more than 1 hour after updated and already tried to make the DLL work anyway and I did not find a correct way to do it. 1. The proxy DLL (EasyAntiCheat_x64.dll) needed to be updated; I haven't posted here, on the forums. 2. The phpBB version of this topic is outdated, months back. If you check first post, the version being referred to is pretty old. March. 3. The bypass method still works, in the same fashion: DLL + -eac_launch in Steam/UPlay/shortcut's Properties. Awesome news sun! Thanks for all your work and effort! ^ You realize doing 5 & 6 are the only steps you should do, right? I get this error. What to do? Any chance you can post the updated EasyAntiCheat_x64.dll file and table? I prefer to use cheat engine to wemod. Same. WeMod doesn't function with the current version of the game, apparently.